The Major Hotel, 3 stars of Cattolica, with parking, free WI-FI connection throughout the entire hotel, swimming pool on the beach. Admits pets of all sizes. 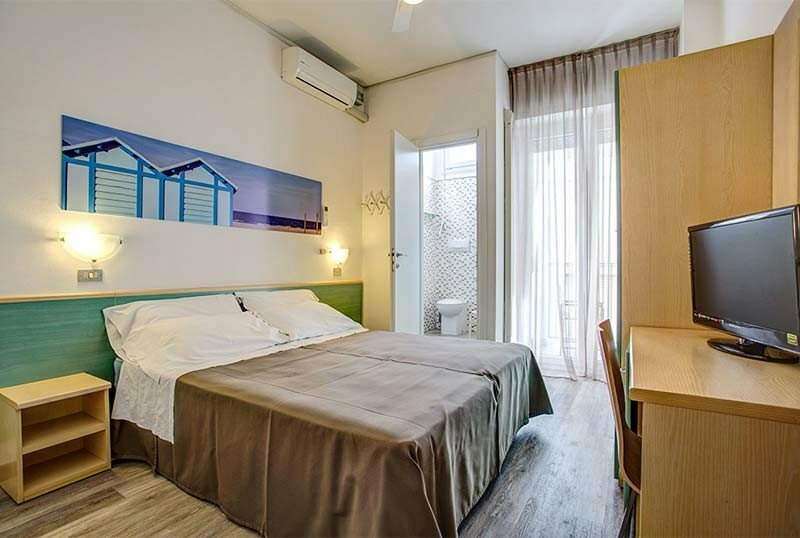 Hotel Major is located on the pedestrian area of Viale Dante, near the beach and the Rasi Spinelli seafront, Cattolica's tourist center. The location is convenient for visiting the Aquarium, reachable in a few minutes by car or with the bicycles provided by the hotel. The rooms are equipped with air conditioning, fan, 26 "LCD TV, WI-FI connection, safe, telephone, minibar, hairdryer, private bathroom with shower box. STANDARD: French balcony, up to 4 beds. SUPERIOR: with a large balcony on Via Dante, or on the back. SMART: read a square and a half. FAMILY: up to 5 beds, cot on request. Garden, open-air porch, 2 lifts, free bicycles, night porter and luggage storage. The hotel is equipped for cyclists and organizes theme nights. PARKING: discovered at 500 m with free shuttle service. PETS: free admission of all sizes. LUNCH AND DINNER: choice of menu, vegetable buffet, appetizers, desserts, fresh fruit. In hotel: strollers, bicycles with child seats, games area with giant screen, live entertainment, baby / mini club, baby sitter. At meals: kitchenette available, bottle warmer, baby menu, baby food, high chairs, dedicated dining room, kitchenette for mothers. On the beach: playground, mini club, entertainment and swimming pool with children's pool. The hotel has an agreement with the Oasis De La Playa beach club n. 68, equipped with sunbeds, beach umbrella, changing rooms, beach volleyball courts, tennis and bowls. The property also has a swimming pool accessible to guests, with hydromassage, area dedicated to children with slides and varying heights. Special Children's Week Free at the Hotel Major in Cattolica! Rate of € 60 per adult per day All Inclusive with a child always free (in the room with parents) and open bar no limits! Contact us without obligation we are at your disposal. Celebrate with us and enjoy the Easter & Holiday Bridges 2019! Soft Open Bar from H24 dispenser at the bar and restaurant. Special promotions for children and families. Book your holiday by April 30th 2019 and you will immediately receive a 10% discount on the best available price. All Inclusive treatment starting from € 39.00 per person per day. We organize sports retreats for teams of football, volleyball, basketball, swimming, athletics with full board packages + use of sports facilities. Rates for groups starting from € 45.00 per day per person. Possibility of board Mazza with only € 16.00 per person per day. Call for free information and quotes. Book your holiday by 04/30/2019 and you will immediately receive a 10% discount on the best available price. All Inclusive treatment starting from 39 euros per person per day. Contact us now for information and quotes. Rate of € 60 per adult per day All Inclusive with a child always free in the room with parents! And don't forget ..... The Open Bar No Limits is only with us! During the month of July 2019 the major hotel offers an all-inclusive rate of € 65 per person per night! Full Board + Drinks with meals + Entertainment (in the Hotel and on the beach) + Beach Service (1 umbrella and 2 beds per room)…. + all our hospitality + OPEN BAR SPECIAL H24 (Wine, Beer, Water, Soft Drinks).